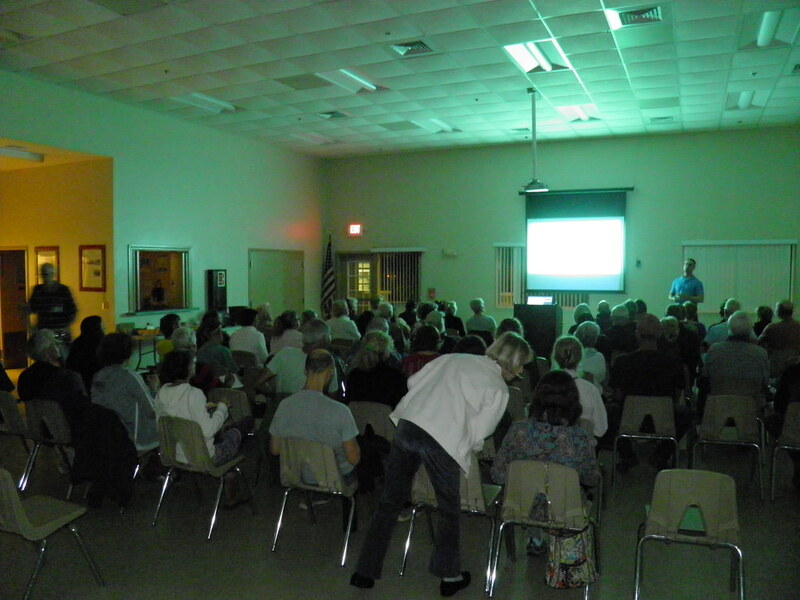 PHOTO ABOVE: Alex Salazar presenting a slideshow on Sapodillas for Florida to the Suncoast Tropical Fruit & Vegetable Club in Nokomis. ANDY'S REPORT FROM THE ROAD: I was fortunate to attend a recent monthly meeting of the Suncoast Tropical Fruit and Vegetable Club in Nokomis (which is just south of Sarasota on Florida's west coast) on January 9th, 2019. The featured speaker was Florida mango expert Alex Salazar, owner of Tropical Acres Farms in West Palm Beach (formerly located in Loxahatchee Groves). Alex maintains a seasonal fruit stand with limited hours ("Open every day during mango season" - call first) and also sells mango, avocado, and sapodilla trees (retail and wholesale), fruits and budwood. As it turns out, Alex is no slouch when it comes to also knowing his sapodillas very well. The night's discussion detailed the best sapodilla (Manlikara zapota - Sapotaceae Family) cultivars for Florida and their culture. NATIVE RANGE: Sapodillas are likely native to the Yucatan region of Mexico. They later spread to Central America. DESCRIPTION: A large evergreen tree that consistently produces fruits, requiring little care. The fruits are actually (botanically) a berry. Fruit size ranges from a few ounces to almost four pounds each. Alex has grown fruits to almost four pounds! Flowering tends to occur continuously throughout the year. Fruiting occurs over a "very extended season", often with multiple crops. Trees are "very slow to establish". The branches are brittle and are "prone to limb breakage". FRUIT FLAVOR: To quote Alex's website, "A decadently rich and sweet fruit, Sapodilla has at times been likened to a brown sugary pear, due to older varieties having a tendency towards gritty flesh texture. However, we now have cultivars of sapodilla that have very smooth textures, and we liken them more to a persimmon!" NUTRITIONAL VALUE: "They are high in vitamin C and dietary fiber." HOW TO TELL IF A FRUIT IS RIPE ON THE TREE: At maturity, fruits begin loosing their "scurf" (hairiness). The best way to tell if a fruit is ready for picking is by scratching the skin. Unripe fruits are a bright, almost emerald green color beneath the skin, while ripe fruits are a "light-green, yellowish color at maturity". Fruits that don't "bleed" with sticky white sap from the stem when picked should ripen perfectly. COMMON NAMES: Sapodilla. Neesberry or Naseberry in the Caribbean. Nispero in much of Latin America. Chiku in northern India, Pakistan, and parts of Asia. USES: The fruits are eaten when soft and ripe. They dry well. The sap, aka "Chicle" was chewed by the Aztecs and has been made into chewing gum. COLD HARDINESS / PLANTING LOCATION: Sapodillas are only for south and south-central Florida. He has seen some "big old trees" in Orlando. Mature trees, on average, tolerate 24-25F. Trees will grow and fruit in the shade, but they will produce fewer fruits. Trees prefer well drained soil. SOIL CONDITIONS: They perform well in high pH soils and nutrient poor soils. POLLINATION: Trees tend to be more productive when other cultivars are planted nearby. Flowers are mostly pollinated by flies, along with wasps, and bees "a little bit." Wind is also a pollinator to a limited extent. PRUNING: Prune trees, if you want to, beginning at a young age. Alex recommends keeping trees pruned to under 15' tall. FERTILIZATION: Alex recommends a balanced N-P-K fertilizer with minor elements during the trees first years of its life. With age, trees require less nitrogen and like more potassium. IRRIGATION: Recommended for the first few years. PESTS: Not many insect pests. Some aphids, scale, and mealybugs may appear. Young trees are sometimes attacked by Sri Lankan Weevils and caterpillars. PROPAGATION: Trees may be grown from seed but this is not usually recommended due to the fact that the fruit quality doesn't remain true. Grafting is most often recommended. Seedling trees usually have a long juvenile period. That said, some wonderful varieties, such as Thomas, came from selected seedlings. - Alano - Hawaiian variety. A "bulletproof tree". The main crop appears December through February. Small to medium-sized fruits. "About as sweet as they get". - Hasya - Mexican variety. "Excellent, excellent!" One of Alex's favorites. Medium to large fruits, to one pund each. Vigoruos. A handsome ornamental tree. Mexican - It may produce few fruits without a cross pollinator. - Makok - A dwarf (very low tree). Small fruits. A "very, very good" variety. Very productive. Summer fruits (July to August is the peak). Super sweet flavor. Fruits look like chicken eggs. - Molix - Mexican. Introduced by Zill's. Produces March through May. - Silas Woods - A semi-dwarf. Weak limbs may easily break with heavy fruit loads or in strong winds. - Thomas - ALEX'S FAVORITE! - Alex said that it is "the best Sapodilla"! A seedling variety. Round fruits. Individual trees make both small and huge fruits (to 3 pounds). The small fruits are often seedless. The flavor is a bit almondy-pumpkin-like. Zill's propagates this variety. - Tikal - One of Alex's favorites! The flesh is sort of a reddish color. Fruits later than most (in the Spring). No grit. - Oxkutzcab (aka Ox) - Too gritty in texture for Alex. ABOUT ALEX: "Alex Salazar grew up in south Florida and has had a long time passion for mangoes. In 2011 he founded Tropical Acres Farms, Inc., now in West Palm Beach. Over the years he has collected over 250 cultivars (ANDY'S NOTE: Now approximately 400 cultivars!) of mango, and is still planting more." - Treasure Coast Rare Fruit Club. ALEX'S OUTSTANDING WEBSITE: CLICK HERE.